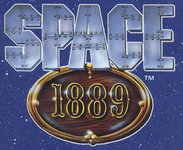 Space: 1889 is a role-playing game of Victorian-era space-faring, created by Frank Chadwick and originally published by Game Designers' Workshop from 1988 to 1991 and later reprinted by Heliograph, Inc. in 2000 and 2001. On March 24, 2009, Pinnacle Entertainment Group announced that they plan to publish a new Space 1889 campaign titled Space 1889: Red Sands, using their Savage Worlds rules system and their Plot Point campaign design model. The name is both a parody of the television show Space: 1999 and a continuation of the GDW naming convention applied to two of its previous role-playing games, Twilight: 2000 and Traveller: 2300 (the latter of which was later renamed 2300 AD), though neither previous game had any connection to the Space: 1889 universe. The name Space: 1889 is a registered trademark belonging to Chadwick. Newest version. Project on hiatus. A character sheet for playing in the Space: 1889 setting with Chaosium's Basic Role-Playing ruleset.